TV host-actor Ryan Agoncillo said he and his wife Judy Ann Santos had already chosen names for the child they are expecting, but they want to keep them secret for now. "Meron na kaming kaunting napag-uusapang names, pero sa'min na muna yun. Siyempre mahirap nang maudlot di ba?" he explained. 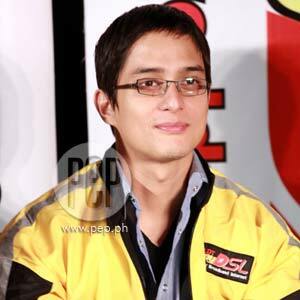 TV host and actor Ryan Agoncillo was very accomodating to reporters last Wednesday, July 1, in a presscon held in Ascend Bar in The Fort for PLDT myDSL QIK kit. He said he was very eager to go back to work after getting over a throat infection last week, which left him very sick and unable to attend to his commitments. "Oo, last week, tinamaan ako ng throat infection, e. Buti na lang throat infection siya at hindi siya yung kinatatakutan nating H1N1. Natatakot din ako dun... the doctors said throat infection. Okay naman, di naman ako na-confine," Ryan said to PEP (Philippine Entertainment Portal) and other members of the entertainment press. The Talentadong Pinoy host said he stayed home the whole time. His wife, Judy Ann Santos, who will play a nurse in ABS-CBN's new primetime darama series titled Narserye, attended to his needs. "Siya ang nag-alaga sa akin the whole time last week. Buti na lang wala silang taping ng Narserye last week kaya siya yung naging nurse ako," the actor said. How good was Judy Ann as a nurse? "Magaling, magaling, magaling. Medyo nahiya lang ako sa kanya dahil in the middle of the night, she has to wake up para gisingin din ako, dahil round-the-clock yung gamot... Masarap nurse mo, napakaganda!" Ryan said with a laugh. HAVING A BABY. The reporters also asked Ryan if he wants to have a baby boy more than a baby girl. According to the George and Cecil lead actor, he has no gender preference as long as they have a healthy child. "Ako, basta malusog, kahit na lalaki o babae, basta malusog na bata ang ibigay sa amin ng Diyos," Ryan said, adding that they already have chosen several names for the child, which they want to keep secret for now. "Meron na kaming kaunting napag-uusapang names, pero sa 'min na muna yun. Siyempre mahirap nang maudlot, di ba? I'm sure magtse-change pa 'yan kapag nandiyan na yung baby," he explained. "Naku, di ko alam! Sana!" Ryan exclaimed.